With only 210 models scheduled for production, spotting one in the wild will be a challenge. On June 13, Aston Martin will unveil the limited edition 2019 Rapide AMR (Aston Martin Racing) at the historic 24 Hours of Le Mans following hot on the heels of the DB11 AMR. The production version of the concept car displayed at the 2017 Geneva Motor Show will be limited to just 210 units. 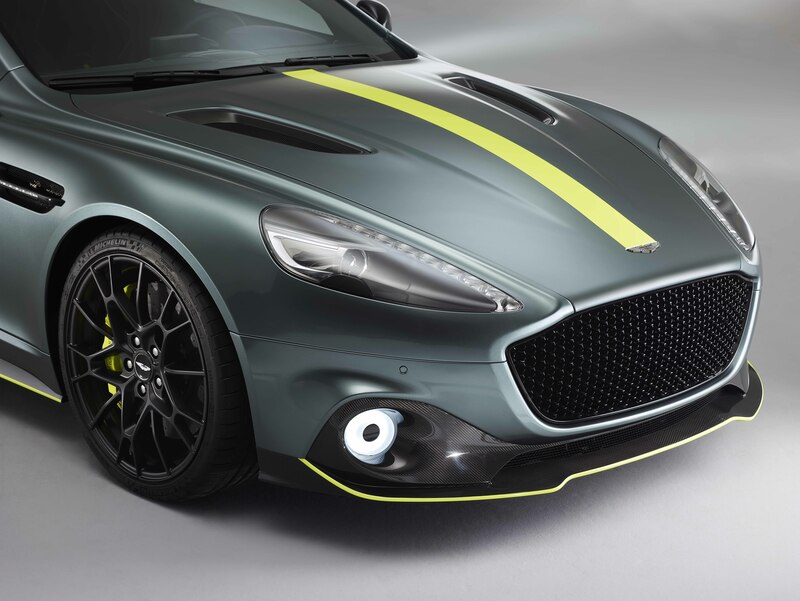 Like the concept car displayed at the 2017 Geneva Motor Show, the 2019 Aston Martin Rapide AMR will retain the large and aggressive front grille, similar to the one found on the track-only Vantage AMR Pro. It will also feature circular daytime running lights, similar to the ones found on the recent Zagato models. When compared to the less powerful Rapide S, the Rapide AMR will also be fitted with additional aerodynamic bodywork consisting of carbon fiber front splitter, side sills, rear diffuser and trunk lid lip spoiler. Together, these components will help reduce lift while retaining a neutral balance of the Rapide AMR at high speeds. 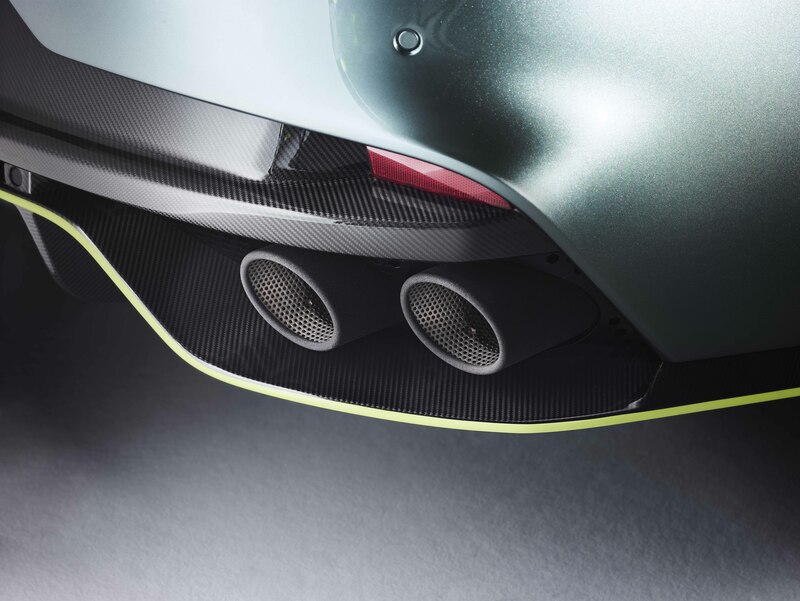 In order to save additional weight, Aston Martin Racing has replaced the aluminum hood on the Rapide AMR with a carbon fiber unit with large ventilation inserts. The naturally aspirated drivetrain in the Rapide AMR shares a lot of its characteristics and technologies with the Vantage GT 12 race car. It's powered by a 6.0-liter V-12, but with larger inlet manifolds with tuned dual inlet runners combined with a new engine and transmission calibration, the engine now produces a healthy 580 horsepower at 7000 rpm and 465 pound-feet of torque. 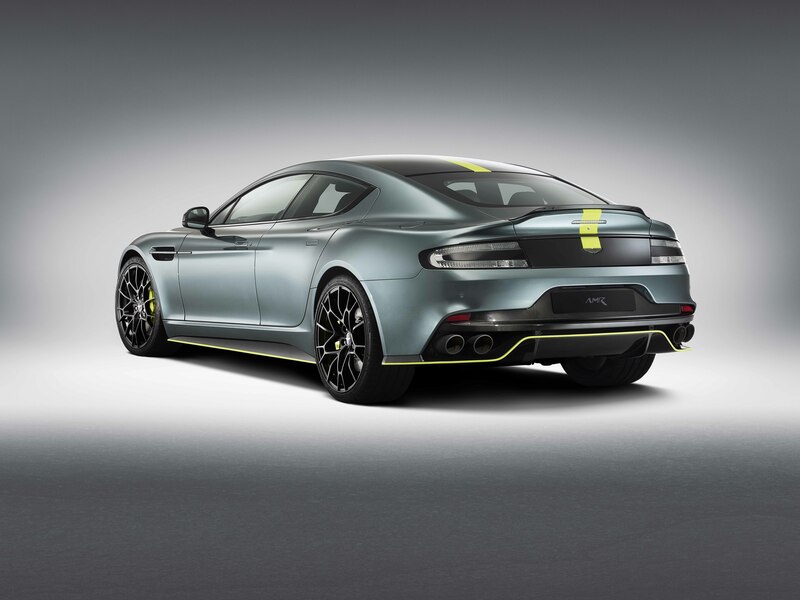 A new quad exhaust system makes the Rapide AMR sound as exotic as the AMR race cars. With the bump in the power output, Aston Martin engineers claim that the Rapide AMR will sprint to 60 mph from a standstill in 4.2 seconds and has a top speed of 205 mph. 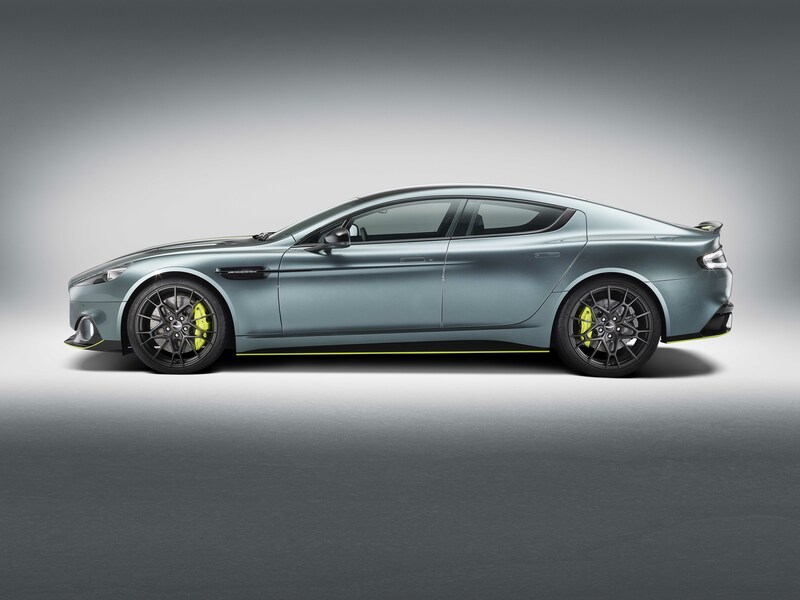 The Rapide AMR is the first model to ride on 21-inch wheels in Aston Martin's history. The wheels are wrapped with ultra-high performance Michelin Super Sport tires measuring 245/35 ZR21 up front and 295/30 ZR21 at the rear. The large, multispoke forged wheels are not only stiff but are also designed to aid with brake cooling. The Rapide AMR also utilizes an evolution of the cooling system found on the Vanquish S, with modified brake ducts and dust shields to further aid thermal management of the brakes. 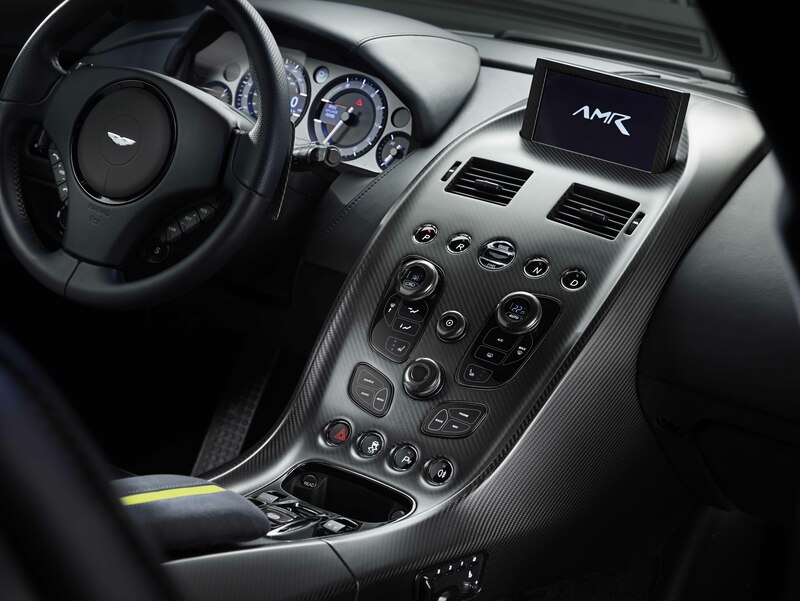 The Aston Martin Rapide AMR comes fitted with carbon ceramic brakes as standard. The front rotors measure in at 400 millimeters and are paired with six-piston calipers. The rear rotors measure in at 360 mm and are paired with four-piston calipers. In addition to the upgraded tires, brakes and aerodynamics, the Rapide's suspension has also been upgraded for AMR duties. The Rapide AMR rides 10 mm lower when compared to the Rapide S, but it does retain the three-stage adaptive dampers. However, these adjustable dampers have been thoroughly re-engineered to make the car more agile, dynamic and focused. Much of the suspension tuning for the Rapide AMR has been completed at the AMR Performance Center at the Nurburgring. When it goes on sale later this year, the 2019 Aston Martin Rapide AMR will be available in three different design schemes: Standard, Silhouette, and Signature. The Standard and Silhouette schemes are available in four colors: Marina Blue, Scintilla Silver, Lightning Silver and Onyx Black. The Standard scheme adds AMR Lime accents to the splitter, sills and rear diffuser. The Silhouette scheme replaces the Lime accents with a full-length contrasting stripe in China Grey or Clubsport White. For those who are looking for the definitive AMR look on their Rapide AMR, the Signature scheme matches Stirling Green paint with Lime accents and Lime stripe, similar to the liveries found on the Aston Martin Racing team's race cars. The interior color scheme depends on the design scheme chosen for the exterior, with either AMR Lime or Galena Silver wilting and stitching. For the first time in the Rapide, the full-length carbon fiber center console and the seats are covered with Alcantara. A One-77 style steering wheel is also available as an option for the first time on the Rapide. 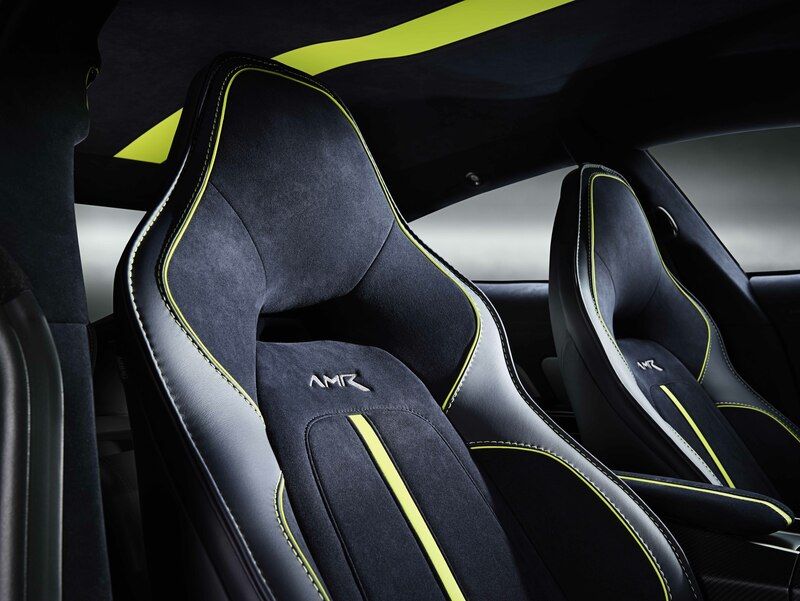 Regardless of the selected design schemes, all 2019 Aston Martin Rapide AMR models will be fitted with discrete AMR logos stitched into the seats in Galena Silver along with a limited-edition AMR inspection plaque and AMR branding on the carbon sill plaques. "AMR takes technology and inspiration form our motorsport [program] to amplify the sporting prowess in our road cars which is clear to see in the Rapide AMR, Aston Martin's most extreme, 4-door sports car," said Dr. Andy Palmer, Aston Martin president and chief executive officer. "With enhanced performance, sharp dynamics and more powerful design language, Aston Martin has taken Rapide to new and exciting extremes." In addition to the three design schemes, Rapide AMR customers can further personalize their car with the use of Q by Aston Martin. The 2019 Aston Martin Rapide AMR will be available globally, with the exceptions of China and Russia. In the United States, the Rapide AMR will carry a starting price of $240,000 and first customer deliveries will begin in the fourth quarter of 2018.